Ernst Conservation Seeds’ crop specialists are frequently asked such questions as: What should I use for a cover crop? When will my meadow mix germinate? How can I tell if I have a successful seedling stand? How many years will it take until the species in my mix bloom? How long will my meadow last? Why did my meadow fail? In the content to follow, we hope to answer these questions. What is the appropriate cover crop for my meadow? These seeding rates are based on our experience with native meadows and our desire to establish strong, individual native plants. 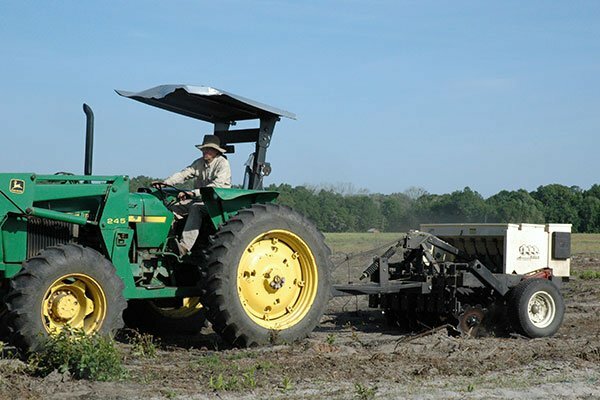 Planting cover crops that are too aggressive or thick diminishes the long-term viability of the perennial meadow plants. We have concluded that annual small grains, such as oats and rye, are the best cover crops or companion crops to plant with native seedings when there is a need. 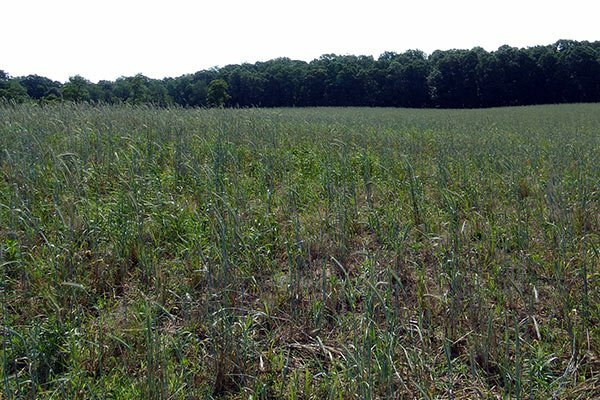 Grain cover crops can reduce competition from aggressive weeds because they grow quickly and also reduce the potential for erosion by providing quick cover. We typically do not recommend annual ryegrass as it is too aggressive and can be persistent due to volunteer seedlings. Most species will germinate, flower and set seed by the end of the first full growing season. Germination of an individual species is likely to be high. Most species will germinate, with some plants within a species population flowering and setting seed in the first full growing season. The bulk of the plants will flower and set seed in the second growing season. Germination of an individual species is likely to be lower than annuals due to the presence of seed dormancy. Warm Season Grasses: Germination will occur in spring when moisture conditions are appropriate and soil temperatures at a 3” depth exceed 55º F (12º C). Best germination occurs when soil temperatures are much higher. Most of these species do not require cold, wet stratification to produce an adequate stand. Two exceptions are Tripsacum dactyloides (Eastern Gamagrass), which needs 14-60 days of stratification, and Chasmanthium latifolium (River Oats), which needs 60 days of stratification for northern genotypes. Stratification is the process of exposing seed to cool, moist conditions. While cold, wet stratification is not necessary in most cases to produce an adequate stand, 20%- 50% of the seed may be dormant. The vast majority of seedlings that emerge will be growing by the end of the second full growing season. Greatest growth of these species occurs when air temperatures are 75º F-95º F (24º C-35º C). The majority of growth is put into root development in the first season. Very few (<5%) plants within a species may flower and set seed in the first growing season. Maximum plant development may take two years or longer. Cool Season Grasses: Some species will germinate when temperatures are a little higher than 40º F (4º C). Others will require warmer temperatures. They may germinate in fall or spring. Adequate stands of most species will not require stratification; however, 50% of the seed may remain dormant without stratification. The vast majority of seedlings that emerge will be growing by the end of the second full growing season. Greatest growth occurs when temperatures are 65º F-85º F (18º C-29º C). With adequate moisture and nutrients, some flowering and seed set may occur in the first growing season. Some sedges (Carex alata, albolutescens, annectans, scoparia, tribuloides, vulpinoidea), rushes (Juncus canadensis, coriaceus, effusus, tenuis, torreyi) and bulrushes (Scirpus atrovirens, cyperinus, expansus, polyphyllus) have a very high seed count per pound of seed. If planted in spring, a substantial number of seedlings may be produced by these species in the first growing season. These seedlings may represent 5% or fewer of the total seeds present. Flowering and seed production will occur one to two growing seasons after an individual seedling has germinated. Maximum germination will take at least two years due to seed dormancy. Sedges and bulrushes will be recognizable by the arrangement of any three successive leaves in a pattern resembling the spokes in the Mercedes™ symbol. Juncus spp. will have round stems that originate at a common point near or on top of the soil. Some sedges (Carex baileyi, buxbaumii, comosa, conoidea, crinita, folliculata, frankii, glaucescens, grayi, gynandra, intumescens, lacustris, lupulina, lurida, squarrosa, stipata, stricta, vesicaria) and bulrushes (Scirpus acutus, americanus, fluviatilis, maritimus, pungens, robustus, tabernaemontani) have a high level of seed dormancy and are unlikely to have any consequential germination without stratification. A majority of seedlings will emerge in the first and second growing seasons after they have been stratified (artificially or naturally). Plants will flower and set seed one to three years after they germinate. Carex spp. in this group may be recognized as described above for other Carex spp. Scirpus spp. in this group have round or triangular stems that arise from a point that is often below the soil surface. The stems are typically larger than those of Juncus spp. Broadleafs: For most broadleaf species, some germination will occur in the first year without stratification (artificial or natural). A high percentage of the species and seeds within the species are likely to germinate in the first growing season following the first winter in situ (on-site). The majority of the seeds that will germinate will have done so by the end of the growing season following stratification. Following germination, blooms may occur in the first growing season (Heliopsis helianthoides, Oxeye Sunflower); second growing season (Rudbeckia triloba, Browneyed Susan; Aster spp., Monarda spp., Penstemon spp. ); after three to five growing seasons (Liatris spp. ); or, not until the seventh growing season (Baptisia tinctoria, Yellow False Indigo). The number of years to bloom will be influenced by soil fertility, available moisture and growing season temperatures. The number of years to bloom may be shorter for a given species the further south you are. Seed dormancy in perennial species is affected by latitude of ecotype origin. In greenhouse studies, we have found that northern ecotypes (PA, OH, NY, NJ) typically require more weeks of cold, wet stratification than southern ecotypes (FL, GA, NC, SC) of the same species. The majority of our native seed mixes are composed of perennial species. Mixes dominated by perennial species have the potential to last for more than a decade if properly maintained. For all mixes, the site must be maintained to keep them free from invasive species or aggressive weeds. Mixes of herbaceous species that have no tree, shrub or vine components in their formula must be kept free from the encroachment of woody or vine species by controlled burning, mowing or spot spraying. The natural communities we create with native seed mixes are dynamic. Annuals, biennials and short-lived perennials may be widely present in the landscape in the first three growing seasons, but non-existent or present in small pockets by the fifth growing season. Over time, colonies of some long-lived perennials will grow larger in area and species composition will change in response to annual variations of drought or heavy rainfall. It is not unusual for those new to planting meadows to be nervous about a mix’s performance during its establishment year. Typically, customers need confirmation that the desirable species are growing. Fortunately, our ability to assess the situation is assisted by a small set of species that generally germinate very well. Over the past 20 years, we have had the opportunity to visit sites or see photographic evidence of many sites where there was a failure to successfully establish a native meadow. We have found some fairly repetitive themes associated with these failures. 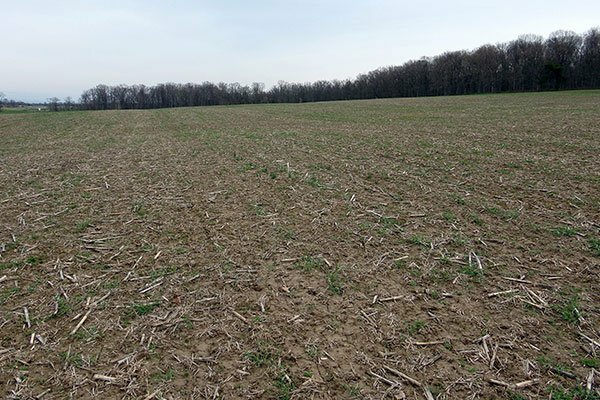 Typically, the problem is related to site conditions, weeds, excessive cover crop seeding rates or use of an inappropriate cover or companion crop. Poor pre-plant weed control: Native species need bare ground to germinate and grow. They do not establish well in a site already vegetated with weeds or lawn. Presence of excessive organic matter used as mulch: Mulch prevents good seed-to-soil contact. A seed may germinate, but its radicle (first root) may be unable to find moisture and the seedling dies. The micro-organisms that decompose mulch or compost consume nitrogen (a nutrient essential to plant growth), resulting in a nitrogen-deficient environment in which a seedling will grow poorly or not at all. If using compost, be certain that it has decomposed to a point where the parent material is unrecognizable. Soil compaction: If you cannot press the tip of a crowbar or piece of rebar 3” into the soil, you have compaction and will get a very poor or non-existent stand. For highly compacted soils, consider broadcasting 1”-2” of well-decomposed compost across the site, followed by rototilling the compost in to a depth of 6”. Herbicide residues (e.g., pre-emergent herbicides) from the previous year: This typically occurs on sites that were previously lawns with a lawn service contract for weed control within 12 months of planting. It can also be a problem when the site was a crop field to which atrazine or Princep® (triazine) had been applied within 12 months of planting. Excessively high or low soil pH: For many plant species native to eastern North America, the availability of many nutrients essential to plant growth is limited in soil with a pH less than 4.5 or greater than 7.5. Ideal pH is 5.5-7.0. When pH is outside this range, choose species tolerant of the site’s pH (you can raise the pH with lime or lower it with sulfur). Drought within two to six weeks following a planting: Seeds cannot germinate without water and seedlings do not grow/survive without water. For drought-prone areas, we recommend planting between late October or when soil temperatures are less than 55º F (13º C) at a 3” depth, and in spring when forsythia and redbud are in full bloom. Erosion (on steep slopes): Caused by a failure to use erosion control blankets or to toe them in at the top of the slope. Erosion is also a problem on slopes where equipment failed to track the soil perpendicular to the slope, resulting in the seed being washed down to the bottom of the slope. Presence of crownvetch, sericea lespedeza, trefoil, tall fescue, bahiagrass, bermudagrass, white Dutch clover, alsike clover, bindweed, mile-a-minute or kudzu that was not controlled prior to planting or which volunteered from dormant seed when soil was prepped for planting: Plants of these species can smother desirable but slow-growing perennial natives. Use of borrowed topsoil infested with seeds of invasive species. Wildlife: Geese can eat seeds, seedlings and mature plants and deer can be devastating to some wildflowers. Lack of proper maintenance: Allowing annual ryegrass cover crop or weeds (e.g., foxtail or ragweed) to smother native seedlings during the first full growing season. Avoid this by trimming the meadow to a height of 8” whenever growth exceeds 18”-24”. Failure to control invasive or problem species prior to planting or after germination. 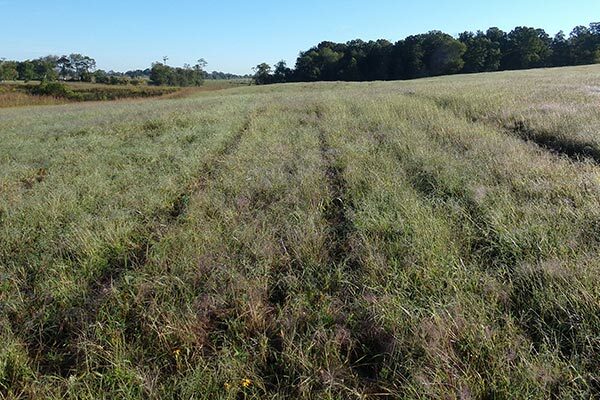 Generally, issues with an excessive rate of cover crop have been confined to the use of annual ryegrass. Excessive annual ryegrass applied to sites planted with native species smothers growth of the native meadow. To date, we have not had complaints when annual ryegrass was used at 10-12 lb per acre (1/4 lb per 1,000 sq ft). 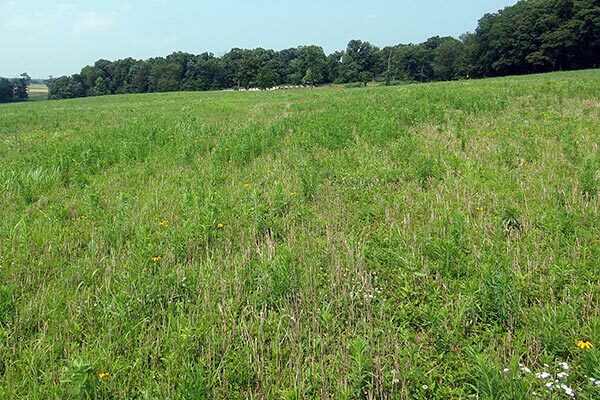 We do not recommend the use of bahiagrass, bermudagrass or tall fescue as cover or companion crops in our native meadow mixes. As a cover crop, bahiagrass and bermudagrass will be impossible to control prior to new growth of perennial native species and will likely smother out the native species when used as a companion crop. We do not recommend the addition of the following legumes to native meadows as they also tend to take over and smother out native species: Lespedeza cuneata (Sericea Lespedeza), Coronilla varia (Crownvetch), Lotus corniculatus (Bird’s Foot Trefoil), Trifolium pratense (Red Clover) or Trifolium repens (Ladino Clover). If these species are already present on the site, spot spray with Roundup® (glyphosate) to control. If you desire a legume in a meadow mix, we recommend the use of such native legumes as: Baptisia alba (White Wild Indigo), Baptisia albescens (Spiked Wild Indigo), Baptisia australis (Blue False Indigo), Chamaecrista fasciculata (Partridge Pea), Chamaecrista nictitans (Sensitive Pea), Desmodium canadense (Showy Ticktrefoil), Desmodium paniculatum (Panicled Ticktrefoil), Lespedeza capitata (Roundhead Lespedeza), Lespedeza frutescens (Shrubby Bushclover), Lespedeza virginica (Slender Bushclover), Senna hebecarpa (Wild Indigo) or Senna marilandica (Maryland Senna). In much of our market area, there are four weeds capable of smothering a meadow during the establishment year: crabgrass, giant foxtail, green foxtail and ragweed. If these weeds overtake your meadow, use a brush hog mower (we do not recommend the use of a lawn mower) or string trimmer to trim the meadow to a height of 8”. Trimming below 4” will kill seedlings of many native species.